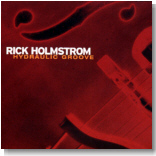 Our Blues Bytes reviewers love that West Coast blues sound, so the natural choice for this month's Pick Hit is Rick Holmstrom's smokin' new CD, Hydraulic Groove. Veteran blues singer / guitarist Alice Stuart makes a smashing comeback with a great new CD. It's this month's Surprise pick. Our main soul aficionado continues his coverage of legendary singer Joe Tex's latest batch of re-issues, reviewed in this month's Flashback. This month's What's New section, in what may be the largest edition of Blues Bytes to date, include new releases from Sue Foley, Billy Price, Melvin Taylor, Terry Robb, Magic Slim & the Teardrops, Shirley Johnson, Mean Gene Kelton and more, as well as a re-issue of an all-time classic, Albert King's Born Under A Bad Sign.